Music has a powerful effect on our emotions. It not only makes the expectant mother relaxed but also calms the baby in the womb. Parents know that a quiet, gentle lullaby can soothe a fussy baby. Children who grow up listening to music develop strong spatial reasoning. The music pathways in our brain are similar to the pathways used for spatial reasoning. When we listen to music, the spatial pathways are "turned on" and ready to be used. Studies show that children who took piano lessons for six months improved their ability to work puzzles and solve other spatial tasks by as much as 30 percent. Playing Music creates new pathways in Brain. Researchers think the complexity of classical music is what primes the brain to solve spatial problems more quickly. So listening to certain music (Classical/Soft music or mild instrumental) may have different effects on the brain than listening to other types of music (Rock/jazz). This doesn't mean that other types of music aren't good. Listening to any kind of music helps build music-related pathways in the brain. And music can have positive effects on our moods that may make learning easier. Parents and child-care providers can help nurture children's love of music beginning in infancy. • Play music for your baby. Expose your baby to many different musical selections of various styles. If you play an instrument, practice when your baby is nearby. But keep the volume moderate. 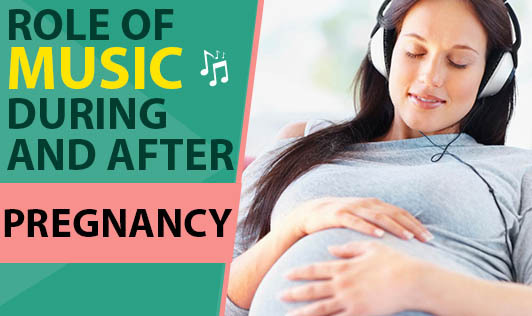 Loud music can damage a baby's hearing. • Sing to your baby. It doesn't matter how well you sing! Hearing your voice helps your baby begin to learn the language. Babies love the patterns and rhythms of songs. And even young babies can recognize specific melodies once they've heard them. • Sing with your child. As children grow, they enjoy singing with you. And setting words to music actually helps the brain learn them more quickly and retain them longer. That's why we remember the lyrics of songs we sang as children, even if we haven't heard them in years. • Start music lessons early. If you want your child to learn an instrument, you don't need to wait until elementary school to begin lessons. Young children's developing brains are equipped to learn music. Most four- and five-year-olds enjoy making music and can learn the basics of some instruments. The natural connection between music and babies goes largely unnoticed by the majority of new and recent parents. With so many things to know and worry about, things like music get overshadowed. Try to incorporate music and enjoy the benefits it has.